Using hands to use your smartphone is so 2007! Voice assistants such as Siri are now very popular. Here are 10 Siri skills to make using your device easier. When it comes to using a smartphone, I always like to paraphrase one of my favorite movie quotes – “where we’re going, we don’t need hands”. Using hands to operate your smartphone is so….2007-ish. These days, all the cool kids use their voice. Only the old fuddy-duddies use their hands! That’s why voice assistants such as Siri and Google Assistant are now extremely popular. Not only does it help you cut down on typing, but it can also reduce the risk of accidents when driving. Siri and Google Assistant are the unpaid overworked secretaries who are nevertheless always happy to connect your call or send your text message. Or search online for an explanation about that “innocent” rash you have. Since I am an Apple fanboy, Siri is my girl. So here are 10 ways that Siri can take over the running of your phone, while your hands are off doing other things. No smutty pun intended. 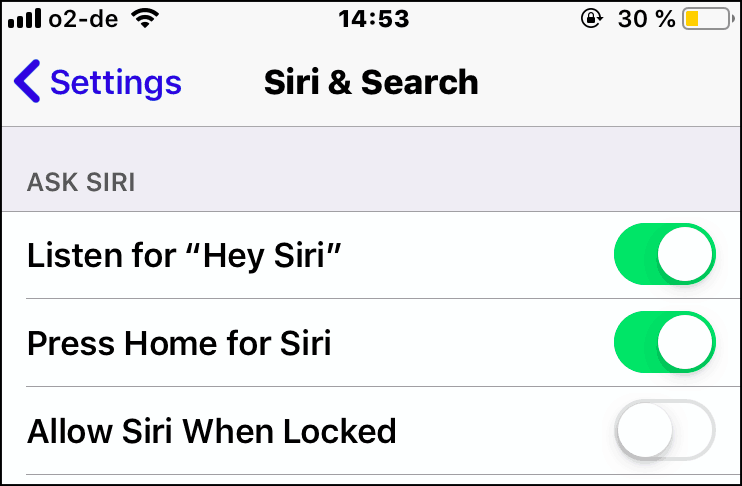 In case you are new to iOS, you can set up Siri by going to Settings > Siri & Search. 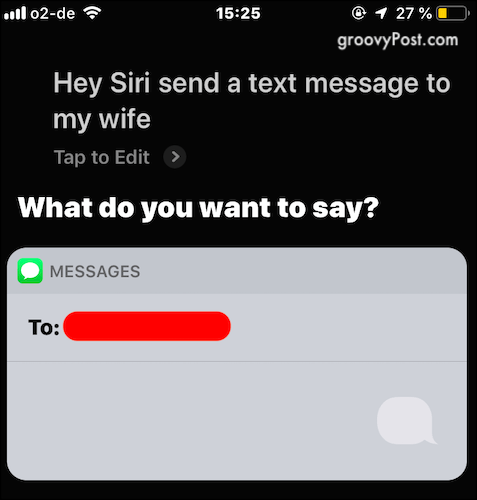 Then scroll down and set up “Hey Siri” so she can be activated without pressing any keys. To use a key to wake her up, double-tap the home button twice. You can also allow Siri while your phone is locked if you want to make things even easier. 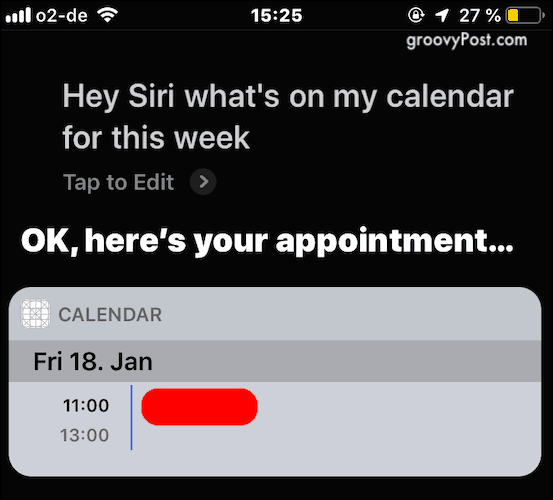 First off, you can ask Siri to read your appointments schedule on your calendar. You can specify how far in advance you want it to go. For example, “today”, “next two days”, “week”, etc. My calendar is extremely light this week but if you have a packed schedule, you may want Siri to stick to the current day’s events. Otherwise, by day 5, you will be ready to smash your iOS device with a hammer. Like your calendar, you can also ask Siri to read out what is on a certain list in your reminders app. But you can also add things to a pre-made list. 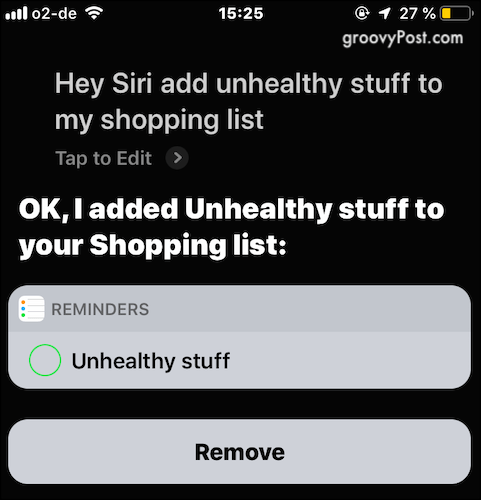 So I have a “shopping list” section in Reminders and when I see we are out of something, I tell Siri to add it to the shopping list. Then when my wife says she is going to the supermarket, I tell Siri to email her the shopping list. My wife and I text each other a lot during the day. Sometimes it’s lovey-dovey stuff, and other times we just like to nag one another. But I have big fingers which can make texting awkward. My wife can do the whole whizzy thumbs thing on her keyboard. But Mr. Pudgy Fingers here keeps hitting the wrong keys and cursing. Thank God for auto-suggest. These days, I am using Siri to send my messages, which is a Godsend if I have the dog sitting on my chest. You can either tell her to text a specific person by name. If you want to tell her to text your wife/husband/son/daughter/whoever, you need to go to your listing in Contacts. Tap “Edit” and scroll down to “Add Related Name“. Choose the person’s relationship to you and link their Contacts listing to you. Obviously, their Contacts listing will need their mobile number saved. On a related note, Siri also recognizes WhatsApp the same way if you are more of “an apper” than a texter. If you are driving, you can Siri to give you directions to a certain address or area. This involves turning on Location Services so Siri can figure out where you currently are. To enable it, head to and flip the switch on. Then tell Siri where you want to go and it will calculate your route. A few seconds later, it will automatically begin the route dictation. But it only does it on Apple Maps, not Google Maps. There are some survival tips that you must learn if you want to survive out there. The most important by far is where the nearest pizzeria is. Just ask Siri for the location of the nearest…whatever it is you’re looking for. 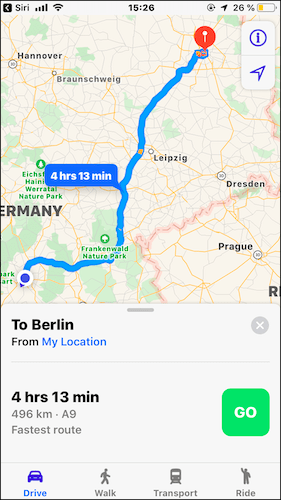 Again, you need Location Services enabled for this to work, and when it sees where you are, it will show you on Apple Maps what you are looking for. You’ll even get opening times. Whatever you need a timer for – boiling an egg, pretending to be Dr. Evil setting up a nuclear countdown, whatever – you can get Siri to set it up for you. Just tell her to set up a timer and specify the length of time. 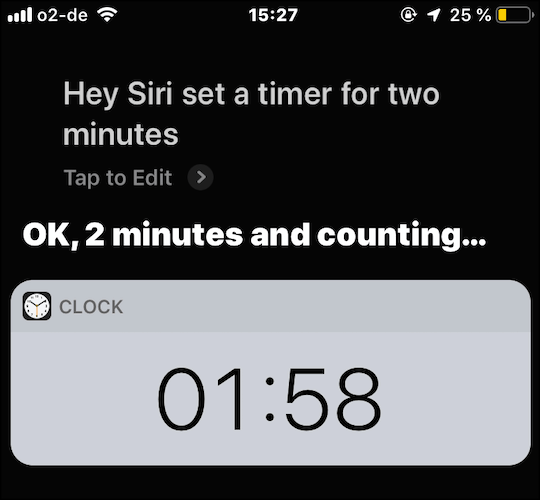 If need be, you can also tell Siri in a separate command to cancel the timer. My wife hates me watching game shows with her. Whenever the presenter asks a question, I double-tap the home button to activate Siri, she hears the question and tells me the answer. Apparently, I kill the fun in watching game shows. 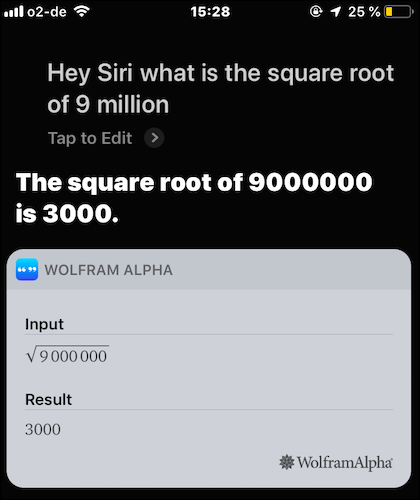 For mathematical questions, queries are routed through Wolfram Alpha. All other queries go to Google. This one is self-explanatory. 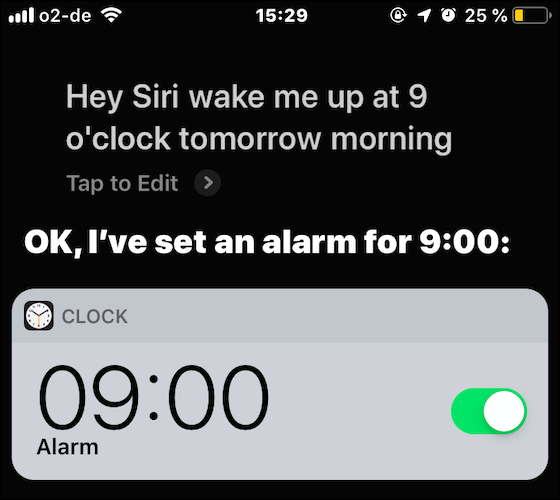 If you need an alarm set, Siri will set one for you if you tell it the time you want to get up. It has a bit of trouble canceling the alarm though. But if the alarm sounds, you can easily tell Siri to switch the alarm off or snooze it. This is one recommended by the editor of groovyPost, Steve. But I can’t talk about it since I don’t use HomeKit. One of the disadvantages of renting a home, instead of owning. The landlady won’t let us add smart devices to the place. 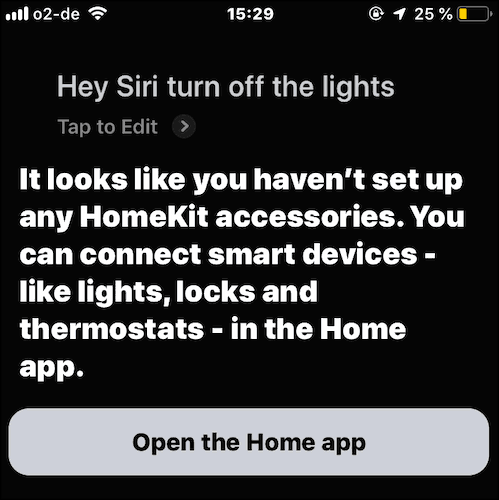 But if you do use HomeKit, you can tell Siri to turn the lights on and off, lock and unlock the door, and more. Just remember though that anything connected to the Internet can be hacked. Which is probably a good reason for me not to use HomeKit. This last one is a bit of a lighthearted one, for when you need a laugh. But Siri actually has a sense of humor when she can be bothered to use it. I say that because sometimes when you ask her for a joke, she says no (seriously). But if you keep asking, she will eventually give you something. 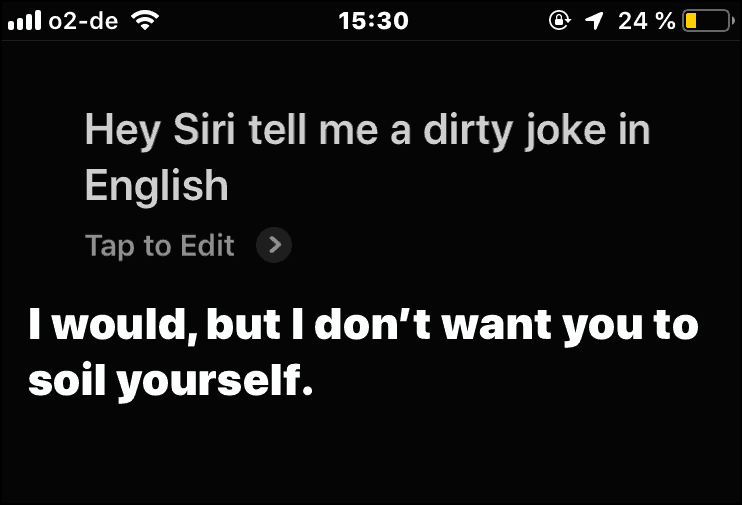 Her repertoire is a little bit limited, but if you are looking for something to spark a few laughs (or groans) at a party, Siri is your girl. 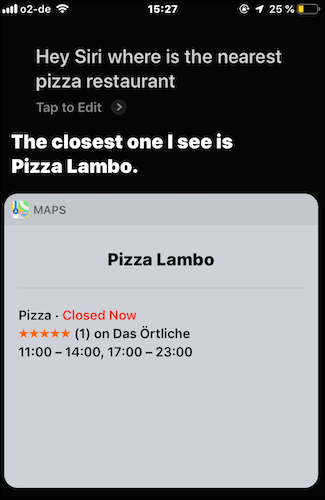 It’s also worth noting that Siri can now interact with pretty much any app on your device, in the sense that you can tell it to open X or Y and it will. I have come across very few instances where Siri has refused to open an app. But obviously, it is most compatible with other Apple apps.